Welcome to MFASCO Health & Safety, your first choice for first aid supplies online. Whether you’re looking for basic first aid supplies, first aid kits, first aid kit refill products, health care products or personal safety products, you’ve found the best first aid supplier with the largest in-stock selection. We’ve got all of the products you need to address your first aid, first aid kit and emergency medical needs. Whether your buying for a business, group, organization or for personal use, we’ve got a wide selection of the first aid supplies you’re looking for including popular name brands products and money-saving generics. With over 60 years of experience, we provide thousands of customers with the first aid supplies and first aid kits they need to keep people safe and protected during emergencies. Our selection of first aid kits include emergency response, OSHA kits, sports kits, empty first aid bags and boxes and basic first aid kits for home and auto. Our vast experience helps us in selecting the most frequently used first aid supplies and we buy direct from top manufacturers to provide you with the best product at the best prices. We know that customers don’t want to wait for their first aid supplies so we process your order fast! Most orders are picked, packed and shipped within an hour of being placed. We make ordering your first aid supplies fast, efficient and easy with an exceptional customer service team that is available to help take orders, find product or help to customize first aid kits, bodily fluid kits and hygiene kits. We love to talk to our customers and look forward to helping you with all of your first aid supplies, first aid kit and first aid kit refill product needs. We’ve created tools intended to make it easier for you to refill your first aid kits or supplies. Our reorder lists help you to create and manage the first aid and safety supplies you are frequently ordering. Our first aid kit refill tools include easy ways to check, maintain and reorder first aid kit supplies. Visit our First Aid Kit Refills Page for more details. 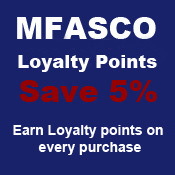 Input an MFASCO item code. Qty. Add To Cart. Done. Get special offers, coupons and resources!